Agribusiness is an off-farm activity. It is dependent on-farm activities especially for availability of raw material i.e. Production. It is important not just to focus on more production for successful Agribusiness is an off-farm activity. It is dependent on-farm activities especially for availability of raw material i.e. Production. It is important not just to focus on more production for successful agribusiness. 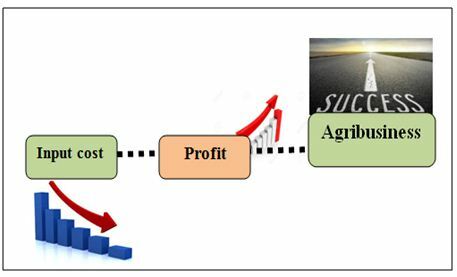 It is the productivity that’s need to focus on profit margin of business in agriculture. While targeting the productivity the input cost that has been incurred in production is much of significance. For profit of course the much of production will fetch much of amount. But if the input cost can be reduced than it can further increase the profit margin. On farm production of inputs is one such means that can reduce the input cost. The best advantage of on farm production is the authenticity of the inputs produced. The inputs purchased from market though are reliable but in some cases farmers complains of poor quality. The farmers in most of the cases have raw material for production of inputs .Vermicompost is one of such input. The farmers in village at least keep 2-3 animals for agriculture and allied activities. The cow dung of animals can be better being converted in to compost through digestion by earthworm. Above all, use of organics is the need of hour from quality aspects .It fetches better price too. Enhancing the water use efficiency (WUE) for irrigation can reduce the input cost. The water stored through water harvesting structures can efficiently be utilized through sprinkler and drip irrigation systems.